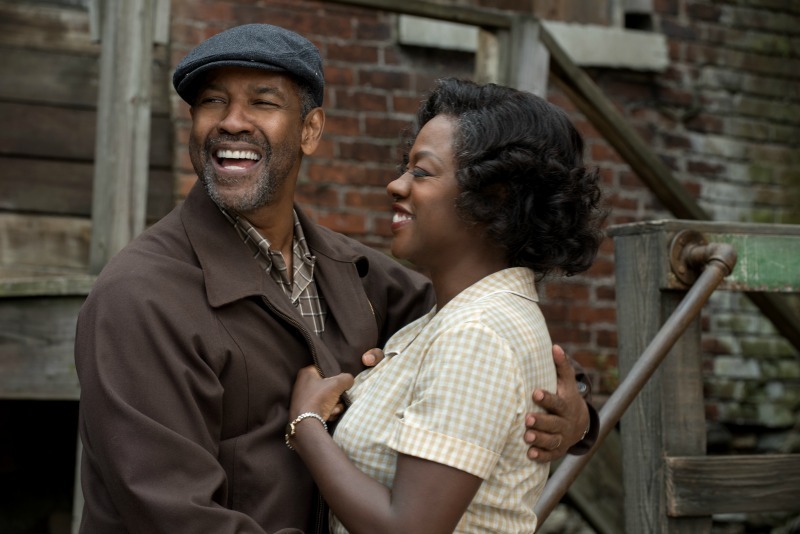 Around an hour into my screening of Fences, the couple sitting next to me started loudly giggling and whispering to each other in a manner that suggested they had clearly lost all interest in the movie. Minutes later, to my intense relief, they left their seats and walked out. They weren’t the only ones. Evidently many of the people who paid to see the movie did so without knowing what they were in for. Personally, I was never tempted to abandon ship, but in retrospect have some sympathy for my obnoxious neighbours. Essentially a filmed adaptation of the stage play, your enjoyment of Fences is likely to depend heavily on your appetite for over two hours of highly theatrical speechifying with minimal action and only a handful of scenes taking place outside the kitchen and backyard of the central couple’s home. It helps that the couple are played by actors of the calibre of Denzel Washington and Viola Davis, who are almost certainly the reason many people will see at least some of this movie. Washington in particular is dizzyingly impressive as the patriarch Troy Maxson, rising to the heightened, almost poetic quality of August Wilson’s dialogue while also imbuing his contradictory character with equal parts warmth, arrogance and vulnerability. The majority of the cast is transferred from the Tony Award winning 2010 Broadway revival of the play, and their experience gives the performances a comfortable, lived-in quality. This is particularly evident in Stephen Henderson, who does charming work as Troy’s old friend and drinking partner Bono (not that one), who ultimately proves to be more perceptive than his genial veneer suggests. Mykelti Williamson is also moving as Troy’s mentally impaired older brother, despite the character being the most obviously theatrical creation of the film. Viola Davis gets a handful of very Oscar-friendly speeches as Troy’s wife Rose, but it’s the quieter moments that really give her performance weight, anchoring Washington’s larger-than-life performance. Together they create a convincing portrait of a long and seemingly happy marriage, making the fallout from a second-act revelation all the more painful. Fences was clearly made with great reverence for the playwright August Wilson, who also worked on adapting his original script before his death in 2005. If anything, that reverence is the movie’s biggest weakness. His dialogue was never going to fit easily into the more naturalistic world of film, but the decision to shoot it like a stage play gives the movie a stilted, hemmed in quality. A more stylised directorial approach could have provided a fresh perspective for the big screen. Instead, while beautifully written and forcefully acted, Fences could have been equally as satisfying, if not moreso, if they’d just filmed it live on Broadway.